The mission of Olympic Spirit is "to build a peaceful and better world in the Olympic Spirit which requires mutual understanding with a spirit of friendship, solidarity and fair play’. Much happening at Rio … and more on athletic field !! Usain Bolt's bid for a triple-triple is on track after winning his preliminary heat in the 200 meters on Tuesday. After winning a gold medal in the 100-meter dash for a third consecutive Olympics, Bolt has turned his focus to lowering his world record mark of 19.19 seconds in the 200-meters - his favourite race. On Tuesday, he powered out of the blocks and ran hard out of the curve before slowing down to win heat 9 in 20.28 seconds. 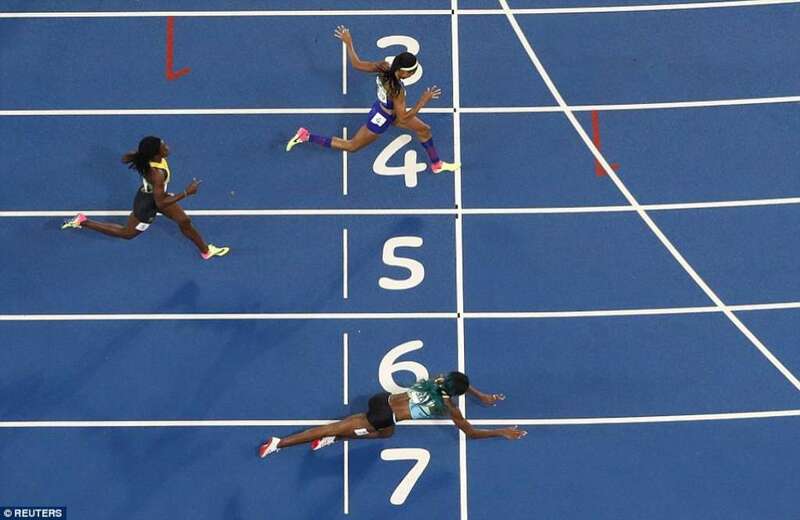 Yesterday, America's Allyson Felix looked set to win the 400-meter dash but she was edged out of first place by that last minute dive from Bahamian sprinter Shaunae Miller. After the race, it took Felix nearly an hour before she could confront reporters, as she told them of her extreme disappointment at failing to bring back another gold for Team USA. Her new silver medal makes her the most decorated female American in Olympic track & field history, ahead of Jackie Joyner-Kersee. The Egyptian judo star who refused to shake the hand of his Israeli opponent after their heavyweight bout at Rio 2016 was sent home in disgrace. Islam El Shehaby lost Friday’s fight against Or Sasson and was told to leave by his own team – as well as being reprimanded by the International Olympic Committee. El Shehaby, 32, said he did not want to shake hands with an Israeli for ‘personal reasons’, nor was he obliged to do so under judo rules. In another ugly spat, the silver medallist of the women's marathon 10km has been disqualified after she wrestled with another competitor who came third. The drama happened as France's Aurelie Muller and Italy's Rachele Bruni crossed the line. Muller appeared to grapple Bruni out of the way in the nail-bitingly close finish, to come second. But her glory was short-lived as she was stripped of her medal-winning position for her role in the incident. Elsewhere, Netherlands hockey star Kitty van Male fell to her knees as she was whacked at Rio 2016. 28-year-old forward grimaced as she was clobbered in the face by Argentina's Agustina Habif in rain ~ however, her Dutch team celebrated a quarter-final win as they set up a semi-final game against Germany. 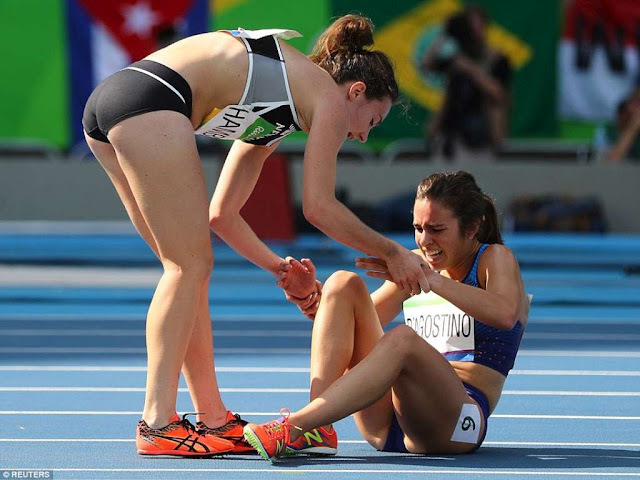 Amidst these news, two athletes have provided one of the most inspirational moments of the Rio Olympics so far when they tripped over each other in the women's 5,000 metres - then helped one another to carry on. American Abbey D'Agnostino and Nikki Hamblin of New Zealand were 3,000m into the race when D'Agnostino appeared to clip Hamblin's heel, sending both tumbling to the ground. But instead of appearing frustrated that their dreams of glory were apparently over, both women put on a display of the Olympic spirit that will live on long after the Games are over. D'Agnostino badly twisted her ankle in the tumble but she was able to summon enough strength to finish the race. D'Agnostino, 24, immediately got up to help her rival - then, as it became clear that she had a right ankle injury, Hamblin tried to help her continue. Both athletes attempted to start chasing after the pack that had left them. But D'Agostino could not keep going as her knee had apparently twisted awkwardly in the fall. She told Hamblin to go on as she collapsed on to all fours on the track. But the camera then came back to D'Agostino and she was back on her feet and running again. Almaz Ayana won the heat in 15:04.35, and Hamblin, who continued on as well, ran 16:43. D'Agostino, who has previously run 15:03 in the event, finished last in 17:10.02. Despite finishing the race in the two last places, both women embraced as though they'd won gold and silver. The inspirational moment encapsulated the Olympic spirit. D'Agostino was then taken away in a wheelchair, but still managed a smile. She was later taken for an MRI scan. News & photos from various articles of Daily Mail UK.